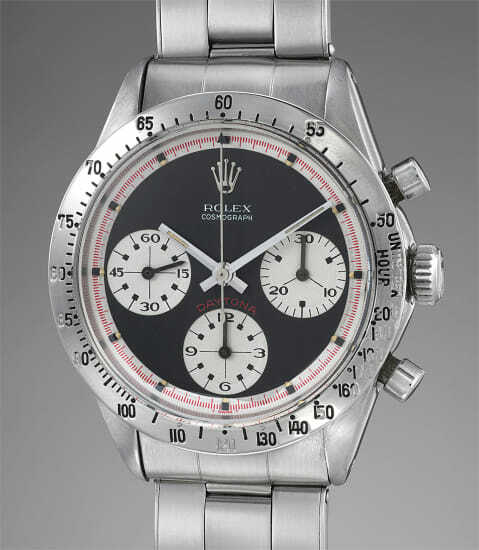 Model Name: Daytona "Paul Newman - Musketeer dial"
At Rolex, 1970 was marked by the launch of two Cosmograph references; the 6262 with the silver bezel and the 6264 with an acrylic bezel. Very similar to the previous generation, these two references were fitted with the upgraded caliber 727. As often in production, the new reference was launched when spare parts from the precedent was still available hence some of the first models produced, like the present one, using a caseback with the previous reference written inside. Both references were produced for a few years only and were the last Daytona references to be fitted with pump pushers. Displaying yet another variant of a “Paul Newman” dial, this tri-color reference 6262 displays numerous points of great interest. The most interesting being the so called “Musketeer” dial. Most of the Paul Newman dial have concentric circle pattern on the subdials. However, on this specific dial, the subdials have those concentric circle covering only two-third of their surface, leaving the outer portion, where the numerals are printed flat. The “T Swiss T” designation at 6 o’clock is also flatter than its predecessors. Presented in excellent condition, this rare dial version is stunning and is further framed by a beautiful MkI bezel. This exclusive combination will appeal to the most discerning Daytona collector.